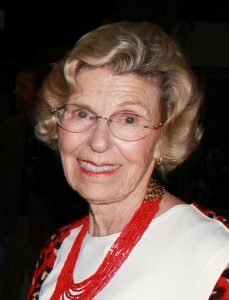 In recognition of her lifetime of charitable work through the Greater Pasadena area, longtime San Marino resident Rary Simmons will be the guest of honor at the Pasadena Senior Center’s annual Zest Gala this weekend. Simmons, who raised five children in San Marino, has lived in the community for 65 years, 62 of them in the same home. (“Can’t move,” she quipped. “The closets are too full. It’s too much trouble to clean them out.”) Growing up in the small, affluent community is what inspired her to give so much back, Simmons said. Simmons recalled the time when, as a PTA president, she attended a state conference and a counterpart from a Watts school asked her about her executive board. It turned out that her PTA’s board had more people than the Watts school’s entire PTA membership. “San Marino is a unique community. You’re a little embarrassed by how good things here are,” Simmons admitted. Since graduating from Occidental College with a bachelor’s degree in psychology, Simmons said, she has “never worked,” but anyone else might say she’s worked more than most. She is currently on the advisory committee for Pasadena-based Cancer Support Community. In San Marino, she is on the board of directors for Hill-Harbison House, which hosts San Marino Girl Scout troops and some of the city’s Recreation Department activities. Simmons also holds emeritus membership in the Huntington Hospital Board of Directors and Occidental College’s board. Previously, Simmons chaired the board for what is now Hathaway-Sycamores Child and Family Services and served on boards for the Los Angeles Music Center, Hillsides home for foster children and the Pasadena Showcase House for the Arts. How did Simmons find her way into all of this? The door opened, she said, when as a young mother she started joining PTA groups. Chairing the 1974 Grad Night at San Marino High School was a highlight, Simmons said. (Grad Night is a themed event at SMHS that keeps all the graduates together in the gym for a safe celebration.) The theme that year was “Enchanted Forest,” and the event featured a design inspired by Middle-earth from the “Lord of the Rings” book series. Memorial Coliseum. Notable guests included actor Jack Nicholson and Prince Albert of Monaco. Simmons also was a public servant, becoming San Marino’s first female City Council member and later its first female mayor. She served on the council for 10 years. In spending her whole life in this community, Simmons said it has been only a pleasure, with wonderful people and much to do. She said it was easy to get others to join her in giving back and lending a helping hand. The Zest Gala is this Saturday, Sept. 29, with Dr. Drew Pinsky of radio and television fame serving as master of ceremonies. For more information or to receive an invitation, email pamk@pasadenaseniorcenter.org or call (626) 685-6756. Tickets are $200 and will include the location of the event.